Instead of going to an expensive car dealership for quality auto repair Concord drivers can trust, they take a short trip to Walnut Creek and visit us. We’ve been in the auto business since 1984, which means we have over 30 years of experience in the industry. We have a full-service auto shop staffed with certified mechanics and technicians who are experienced with most makes and models of cars. An easy way to keep your car out of the shop is to keep up with manufacturer-specified car maintenance. The timeframe for you to have your car serviced varies from car to car, but the general rule for getting your oil changed and tires rotated regularly remains true. 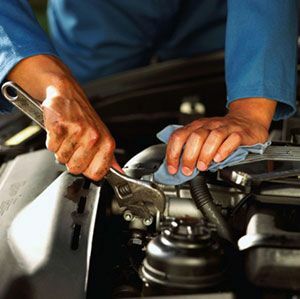 We offer a complete car maintenance package that includes an oil change, filter replacement, up to 5 quarts of Kendall GT-1 motor oil, test drive (to make sure nothing sounds unusual), 30 point safety inspection, tire rotation/ inspection/ inflation, battery test, a top-off of all car fluids, and a chassis lubrication. Maintaining you car is the best way to ensure your car remains safe and reliable. Our number one goal is to provide our customers with satisfaction and safety. All of our mechanics work hard to make sure your car drives as safely as possible, but unexpected things happen, so you might need auto repair. Concord drivers trust us to care for their cars and provide a great alternative to dealership service. Make an appointment to come in to our full-service auto repair shop by calling us or scheduling an appointment online. We often have great web specials that provide an even greater value for your dollar, so be sure to check them out!